I had heard of Taiwanese shaved ice before we got to Taiwan. Honestly, I dismissed it. I envisioned the disgusting snow cones that help define the 1980s for me. But the first time I tasted shaved ice at the Hualien night market, I was a fan. I started searching it out after tasting two more variations within the same day in Tainan. Still, it didn’t hit me until my mom wanted to walk a mile in 80 degrees for one last taste before flying home. Taiwanese shaved ice is fantastic. Mom, this post is for you. At this point, I’ve eaten a lot of it. But I’m still confused about exactly what constitutes shaved ice. Some of it’s almost like eating a light, airy ice cream. More often, it’s flakes of ice topped with fresh fruit, custards, jellies, and other toppings. It can be finished off with sweetened condensed milk, or even ice cream. In Tainan, I once ordered a selection of sweetened beans and lotus seeds that came topped with ice. I didn’t even take a picture because it literally looked like a bowl full of ice flakes (the goodies were hidden underneath). But it was so refreshing—and I never saw one quite like it again. We tasted our first shaved ice on our second night in the country. Without even looking for it, we encountered this delicious treat and so I took it for granted. But I soon realized two things. First, the Hualien night market is a pretty special place. Second, shaved ice is not as ubiquitous as it should be. Night markets are a good bet for finding it, but not guaranteed. We ate shaved ice just as often in small shops (and one large store). If you learn no other Chinese, the characters for xuě huā bīng (雪花冰), meaning snowflake ice are worth knowing. When searching maps for shaved ice, all sorts of results for cold desserts show up. The Chinese name for Taiwanese shaved ice will help you find the real thing. It is also called bào bīng (刨冰), which is where the English name comes from. But if the shops we went to used this term, then I didn’t notice. This tiny Tainan shop with only sidewalk seating had a wait during a weekday afternoon. 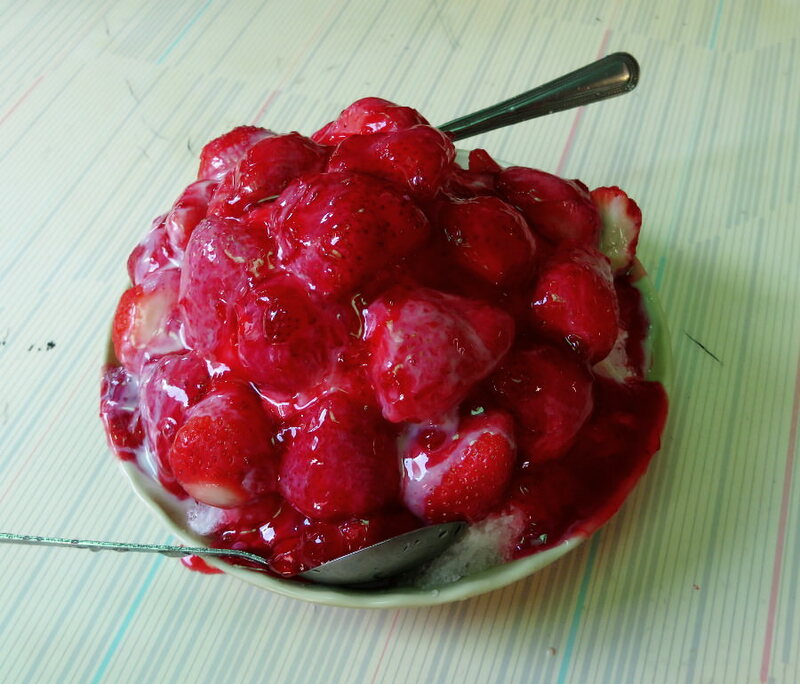 Everyone was eating shaved ice topped with fresh strawberries and sweetened condensed milk. Each one was very large with some tables sharing one among five people. Even though we had already eaten shaved ice that day, we couldn’t resist ordering it. And we ate every bite. Good thing because only weeks later, strawberry season was over. Lucky for us mango season came early this year, following right on the heels of strawberry season. In fact, it was the first day mangoes were available at Ice World in Taipei’s Tonghua Night Market. 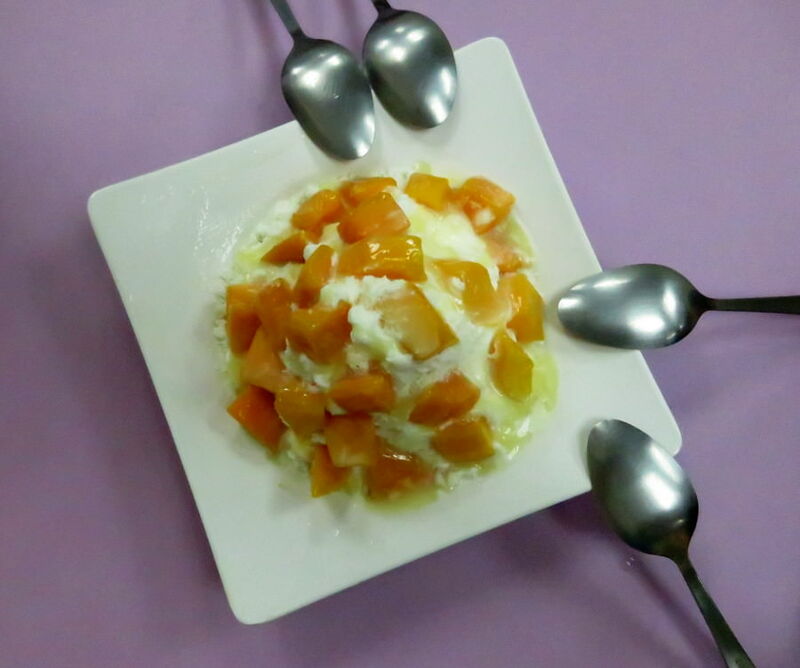 Four of us shared this shaved ice topped with fresh mango and sweetened condensed milk. Then we promptly ordered another one. 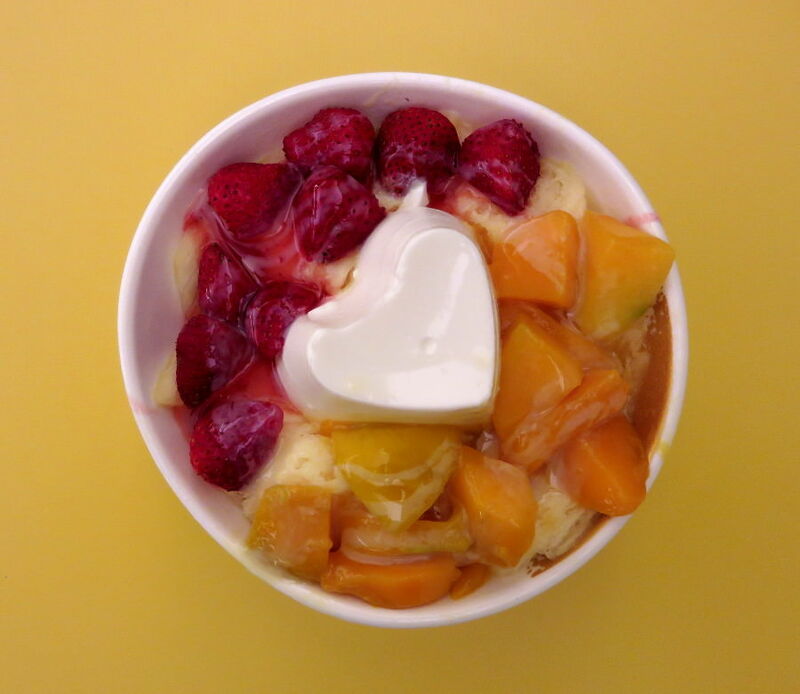 Can’t decide between fresh strawberries and mangoes on your shaved ice? Sometimes you can get both. Even better topped with panna cotta. Fresh pineapple and peanut-black sesame shaved ices. 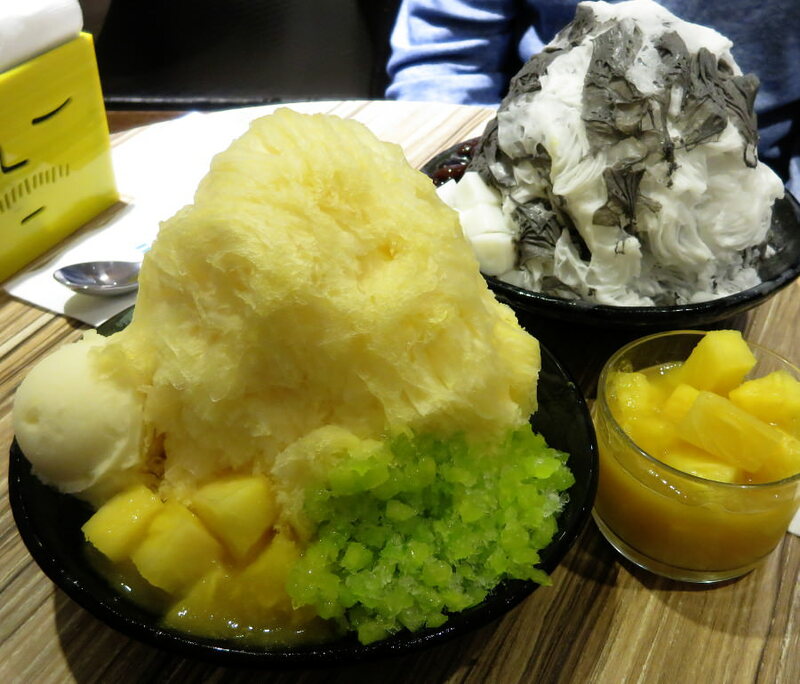 We had read Ice Monster was the best place for Taiwanese shaved ice. We generally prefer to support the little guys while traveling (and at home), but we tried it while in Taipei. Definitely the largest and most elaborate of shaved ices, we still preferred the others. Don’t get me wrong though, we cleaned our plates. That’s saying something because we ordered two before realizing these desserts were enormous. New rule: Always share one shaved ice. Shaved ice for breakfast, lunch and dinner? Yes, please!